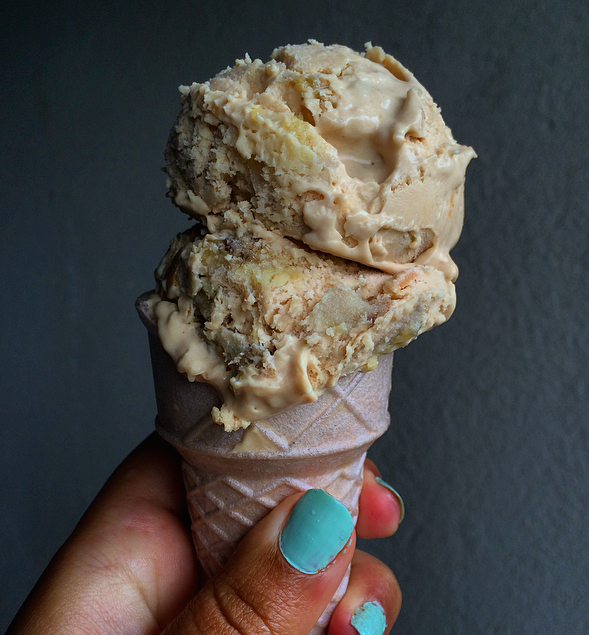 A coconut milk peanut butter flavored ice cream base with roasted banana pieces and peanut butter ribbons. While most people claim that they could never go vegan because they couldn’t give up cheese, my main hesitation always centered around ice cream. Growing up we had ice cream as our nightly dessert more often than not, and in the summer we were pretty much daily patrons of the ice cream man. The constant availability of “Lobster Tracks”, “Moose Tracks” and “Deer Tracks” ice cream at every meal once I got to Colby definitely didn’t help me kick the habit, and I never thought I’d be able to quit eating ice cream completely to go vegan. (Am I talking about ice cream like it is a drug? Maybe. But, hey, I really liked ice cream. Luckily, despite popular belief, being vegan doesn’t mean giving up all the foods you’ve ever loved and eating exclusively kale salads and chia seeds (although, to be honest, I do eat my fair share of kale and chia). There are vegan versions of pretty much every food and (for the most part) they are delicious. Grocery stores sell an amazing variety of vegan ice cream options and even Ben & Jerry’s is working on developing vegan flavors! The two main things that helped me adjust to the vegan ice cream life were getting an ice cream maker (thanks Jeff and Michelle!) 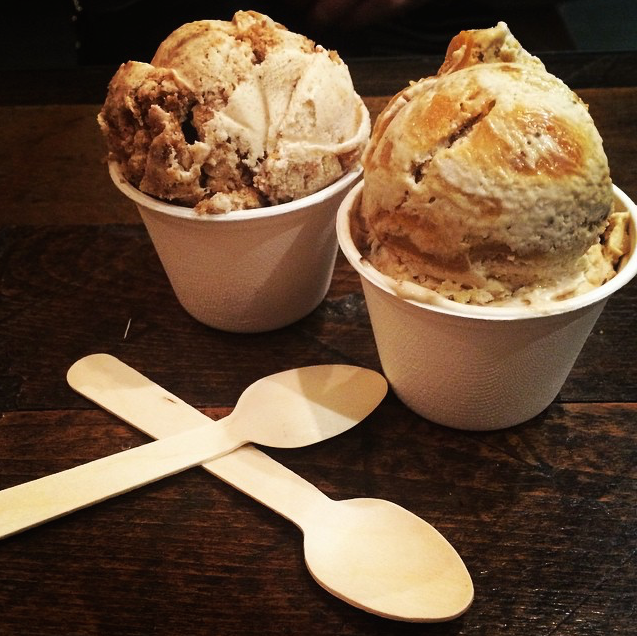 and the discovery of FoMu, an all vegan ice cream parlor 10 minutes away from my apartment. In fact, FoMu may have made the transition a little too easy, since now I’ll pretty much eat there at any chance I can get. Making vegan ice cream was the first time I actually thought through food science principles to develop a recipe. It was really interesting to be able to put my chemistry degree to good use and think through the interactions between the different ingredients. My original plan for this post was actually to talk about the science behind making a good vegan ice cream, but I bought a copy of Between the World and Me this morning and I can’t stop reading it long enough to type that up right now, so I’ll save that lesson for my next ice cream recipe. Roasted peanut butter banana was one of my favorite flavors at FoMu, but unfortunately they recently discontinued it. I was sad to think that I would never get to taste it again, so I pulled out my ice cream maker in an effort to recreate it at home. 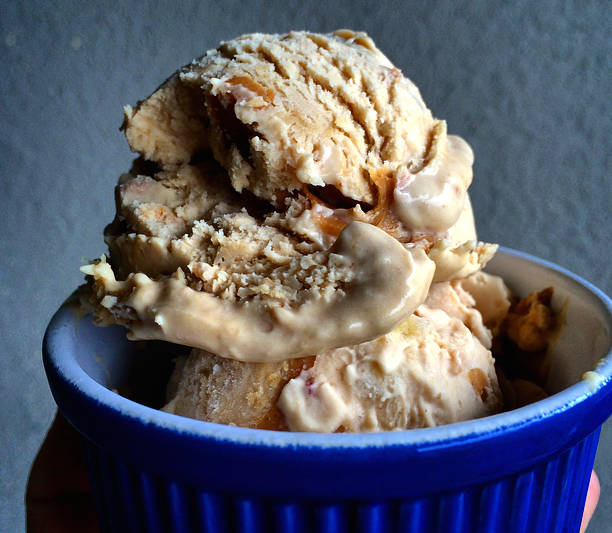 Banana and peanut butter is one of my go-to snacks and this ice cream pairs the two perfectly for a rich and creamy treat on these disgustingly hot and muggy days. 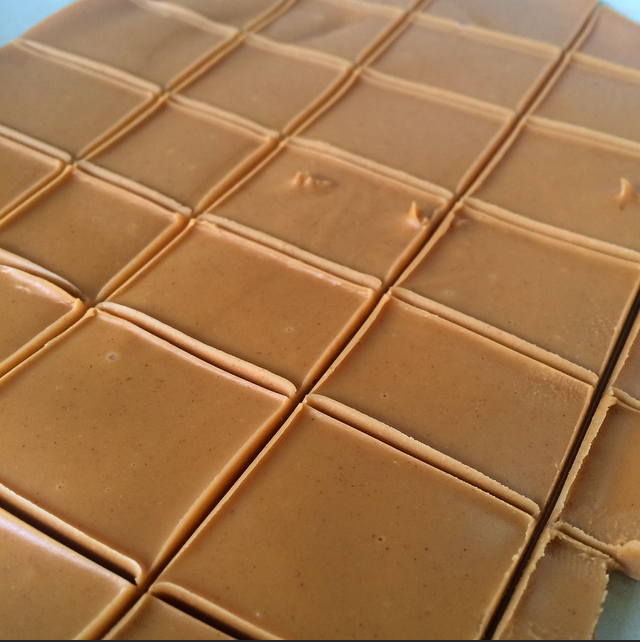 It’s a peanut butter flavored base made with coconut milk, with chunks of oven roasted banana and peanut butter ribbons throughout. While I’ve thankfully moved past my ice cream a day habit, it’s always good to have a recipe in the vault for when the ice cream cravings hit hard. Combine the coconut milk and coconut cream in a saucepan over low heat and gently whisk until the fat and liquid are combined. Add in xanthan gum, sugar, vanilla and salt and continue to whisk until the mixture starts to thicken slightly. 1. Combine peanut butter, coconut oil and powdered sugar in a small sauce pan. 2. Stir well over low heat until thoroughly combined. 5. Remove from the refrigerator and stir briefly. The mixture will be very thick, almost a pudding consistency and stirring it will help break that up into more of a heavy cream consistency. 6. Pour the mixture into your ice cream maker and follow the manufacturers instructions, for mine it takes around 20-25 minutes to reach the right consistency. 7. 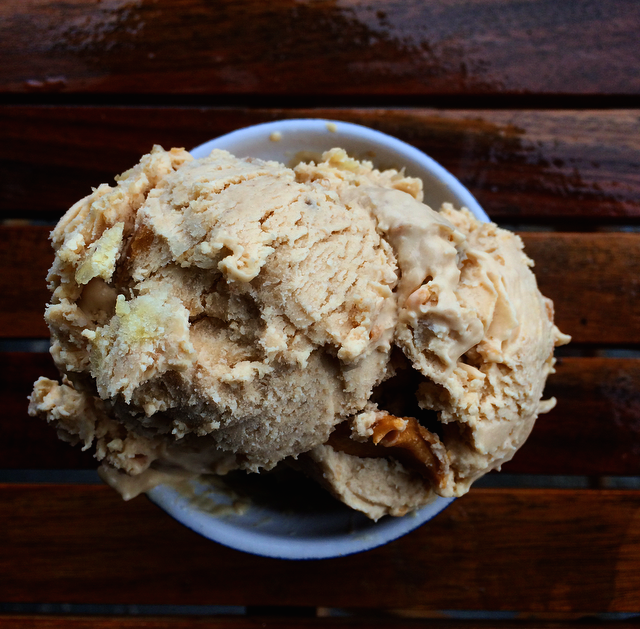 Once the ice cream is approaching its desired consistency slowly add in the peanut butter ribbons and roasted banana pieces and allow the churning of the ice cream maker to distribute them throughout the ice cream. 8. Depending on your ice cream maker and how long you churn it for, you may want to freeze the ice cream for a little longer until it reaches a more solid consistency. 9. If you don’t devour it in one sitting, store the ice cream in an air tight container to prevent the development of ice crystals. This ice cream tends to get very hard when it sits in the freezer, so be sure to give it ample time to thaw (or microwave it for a few seconds at low power) before scooping it. A few weeks ago my friends and I went up to Oaks Head, Maine to spend the weekend at a house on the ocean that Zoe’s parents were renting. It was a perfect Maine weekend complete with good friends, hiking, beautiful views, and a barbecue on the water. It was so nice to get out of the city, and really made me miss the summers I spent in Maine working on the lakes. 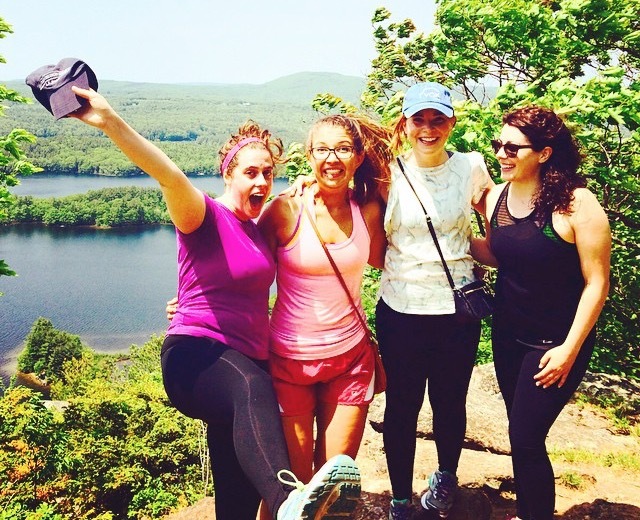 Just really exited about our hike up Maiden’s Cliff. As care packages full of “crack brownies” and lemon bread over the past seven years have taught me, Zoe’s mom is a great cook. While I showed up with my usual arsenal of gluten-free vegan snacks, her parents did an amazing job of making sure I had more than enough to eat. 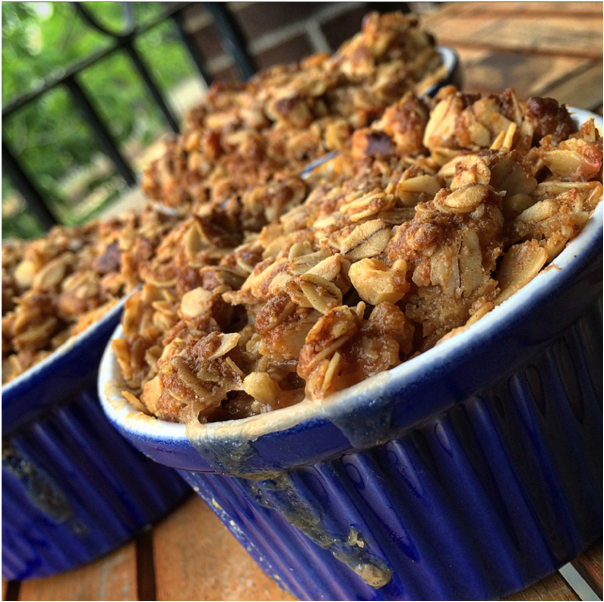 The only thing I wasn’t able to eat was her famous rhubarb crisp, and it looked and smelled so good that I decided on the spot that I’d have to re-create a vegan, gluten-free version of my own to see what I was missing out on. Despite what I thought as a kid, rhubarb is not just red celery. 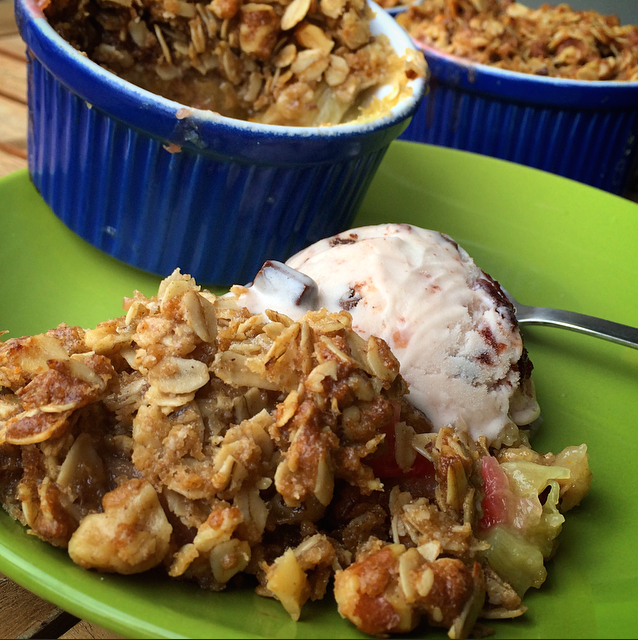 Before making this recipe I had never had rhubarb crisp before. Actually, I had never had any form of rhubarb before in my life. Up until last year, I didn’t even really know what it was, and am slightly embarrassed to admit that when I was little I thought it was just fancy red celery. But, after that weekend I was determined to branch out and give it a try and I am beyond happy that I did. I swear there is rhubarb underneath all of that topping! The crisp was perfectly tart with a hint of sweetness and a crunchy oat streusel topping. I served it warm with a scoop of vegan ice cream, and I was in heaven. While I’m sure I’ll never be able to rival Zoe’s mom’s recipe, I was thrilled with the result. In an effort to stop myself from eating all four I gave some away to my friend, and apparently multiple people stopped her on her walk home to comment on how delicious it looked! This definitely is a great way to sneak more vegetables into your day (even though theres a little sugar mixed in). It makes a delicious dessert, or you can skip the ice cream and have it for breakfast (or don’t skip the ice cream and treat yo’ self, no judgements). 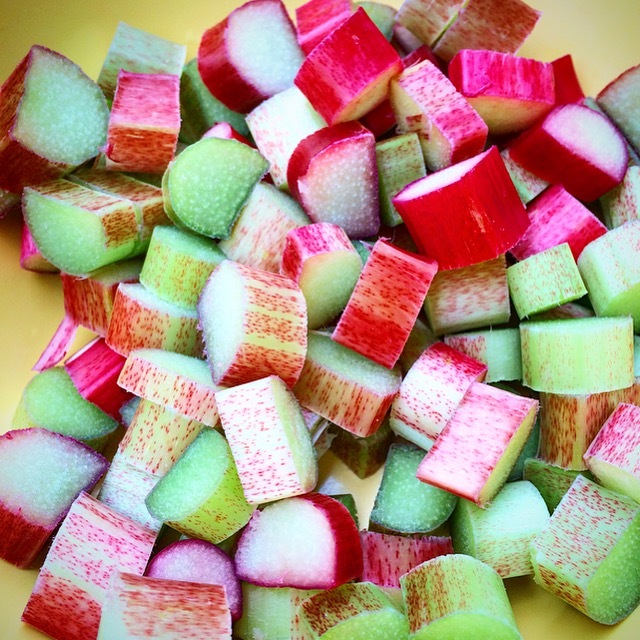 Does anyone have any other favorite ways to cook rhubarb? I’m so curious to learn what I’ve been missing out on all these years! Allow to cool slightly, serve with a scoop of your favorite vegan ice cream, and enjoy!